We are currently looking for a talented and proactive Senior Salesforce Marketing Cloud Developer to join our awesome team. You should have some experience with Salesforce Marketing Cloud – or be willing and eager to learn. This is a very exciting opportunity for the right candidate to join a dynamic, growing agency working across some of Australia’s greatest brands to deliver exceptional marketing solutions. You will be part of a team which has passion for automated digital marketing and provides clients with a high level of current industry, technical and practical advice from project concept through to completion. This is an opportunity to work with some of Australia’s leading brands to deliver result driven strategic marketing programs. Ensuring projects are delivered on time and if delays occur ensure they are communicated with the Project Manager, as soon as possible. Adding AMPscript into code – support will be provided to learn AMPscript. 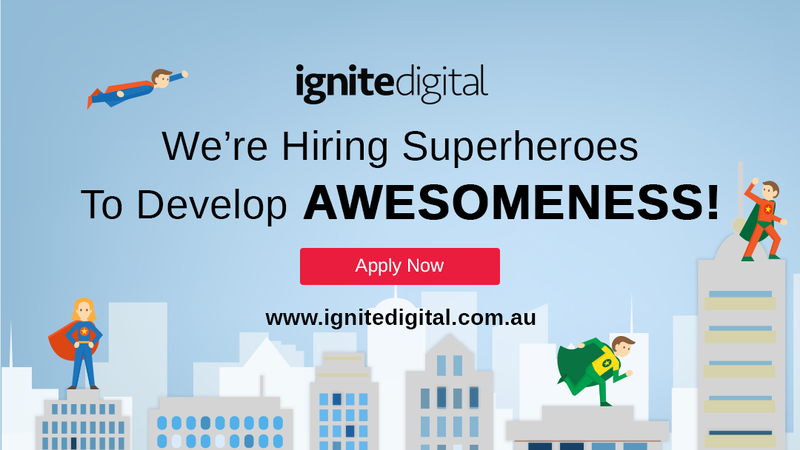 If you think you’d LOVE this role, please apply by emailing us at: spark@igniteidgital.com.au, or complete the online Seek application by clicking Apply Now below.